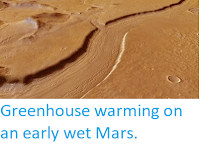 Sciency Thoughts: Mars reaches opposition. 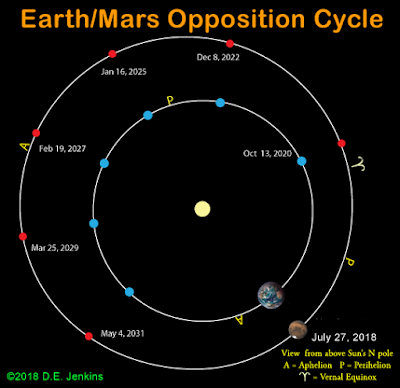 The planet Mars will reach opposition (i.e. be directly opposite the Sun seen from Earth) at 7.50 am GMT on Friday 27 July 2018, when it will also be at its closest point to the Earth since 2003 (when it made its closest approach in about 60 000 years). 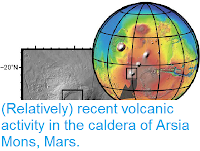 Mars will reach a closest point of about 70 800 000 km from us (47% of the average distance between the Earth and the Sun, or 184 times the distance between the Earth and the Moon), and completely illuminated by the Sun. 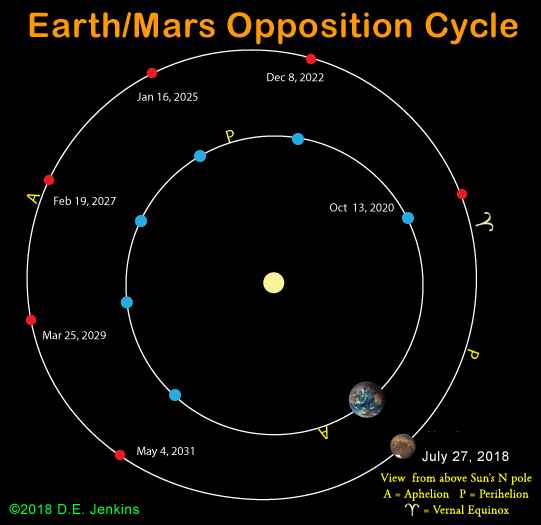 The relative positions of Earth and Mars for the next 13 Years. Oppositions occur roughly once every two years. D Jenkins/Astra's Stargate. 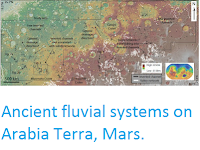 While the relative positions of the planets have no direct influence on life on Earth, the opposition of Mars does present the best opportunity for observations of the planet by Earth-based observers. Mars orbits the Sun at an average distance of 1.52 AU, completing one orbit around the Sun every 687 days. 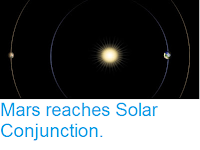 This means that it reaches Solar Opposition roughly once every two year, and reaches conjunction (when it is directly behind the Sun seen from the Earth), in the intervening years. -Face to face Cash on Delivery will be schedule. Some people will want me to send my agents to them so that they can buy directly but for me to send out my agents. There must be a minimum order you want to buy. 120,000 fake counterfeit notes for 30,000 when it comes to face to face buying. Volcanic Activity on Asamayama, Japan. Landslide kills eight in Nan Province, Thailand. Asteroid 2015 AM45 passes the Earth. Asteroid 2018 NM passes the Earth. Landslides kill four children in the Philippines. Magnitude 5.7 Earthquake in Oaxaca State, Mexico. Landslide kills nine in Manipur, India. Asteroid 2018 NU passes the Earth. Magnitude 6.0 Earthquake rattles Tokyo. Californian man killed by wildfire. Fragment of Asteroid 2018 LA found in Botswana. Asteroid 2018 NH passes the Earth. Magnitude 5.0 Earthquake in west-central Albania. Flooding kills eight in Lahore. Asteroid 2018 MG7 passes the Earth. Austrian climber killed by avalanche in Pakistan.